This adapter converts a serial modem cable with 25-pin male connector to a 25-pin female connector and also changes the serial cable to a null modem cable. Null modem cables are used for serial port debugging between computers and also for transmitting information between two computers through the serial port. Features 2x female 25-way connectors, one connector on each end of the adapter, so that this adapter. Installation: plug one end of the adapter into the serial port on the rear of the Amiga and then connect a serial cable (male 25-pin) into the adapter. Ensure your Amiga is switched off first before connecting the adapter. 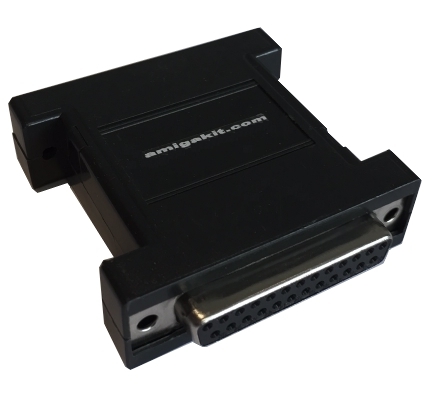 Software: This adapter is compatible with Amiga terminal software, Term 4.8 by Olaf Barthel (available freely from Aminet website).